A guy with sometimes questionable rap lyrics said that, but he got it right. In the world of ecommerce, you have one shot to win a customer and a thousand opportunities to lose them. Once your giveaway ends, the real work begins. A key benefit of hosting giveaways is the opportunity to engage with potential customers. One mistake we often see our customers make is not capitalizing on this opportunity. Once the giveaway ends, it’s your job to turn potential customers into actual customers. Nurture your leads! If you don’t have a marketing and communications strategy queued up, you could be missing out on the full potential of your giveaway. Newsletters. Sending out a newsletter shortly after your giveaway ends is a good way to stay relevant in your entrants’ minds. This is the opportunity to educate potential customers on all of your company’s offerings. Maybe you were giving away one item from your inventory, but you have other products to choose from — let them know! If you’re a blogger, share some information about your site and blog topics. Newsletters should be more informative than sales-y. Don’t assume people know about your business just because they entered your giveaway. Coupons. Call it a ‘consolation prize’ if you will, but coupons work. Sending out an exclusive discount to all of your entrants is a definite way to keep spirits high after the giveaway. Not only will this leave your entrants with a positive image of your business, you’ll also see some conversions. Increase the return on investment! Promotions. The next best thing after a giveaway is a sale. People love a good bargain, and if it’s a product they like or are familiar with, they will be happy to hear about it. That said, try not to be a spammy marketer. No one wants three emails from the same company in a week. It doesn’t matter how much you think your customers love you. This is a good spot to remind everyone about the CAN SPAM Act. Even if entrants opted-in to receive promotional emails from you in the giveaway, your further communications also need to be compliant. Check out the rules for a refresher course. Now that we’ve made our legal plug, back to the regularly scheduled programming. Planning wins. If your followers know giveaways are in your game plan, they’ll be sure to pay attention. You’ll likely turn a new giveaway entrant into a frequent website visitor. 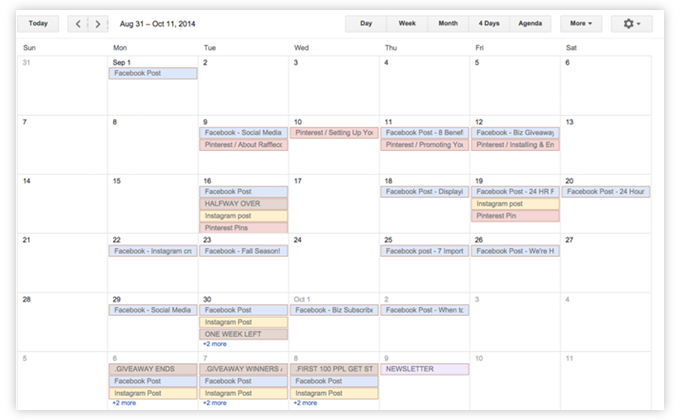 Plan a monthly giveaway calendar for optimal brand engagement. Your next giveaway. Build up the hype. This is definitely newsletter worthy information. If giveaways become a regular feature in your newsletter, people will have a reason to open it. Marketing your next giveaway before it happens will also increase engagement. Our Field Manual has tips and tricks to help you run a successful giveaway. Flash giveaways. Did you know Rafflecopter has a crazy simple app to run giveaways right from your timeline? While your other giveaways may have the ulterior motives of gathering email addresses and market information, flash giveaways are basically a shoutout to your Facebook fan base. They add value to your customer relationships. Flash giveaways are super easy, and they don’t require mega prizes. This is a good option if you have ‘light’ prizes to offer throughout the year. Let’s bring out the big guns. You gained some traffic with your giveaway, and now it’s time to capitalize. On average only 2% of your first time visitors will convert to a sale. That’s 98% of your visitors/potential sales slipping through the cracks. No bueno. Retargeting. Some people may view this as ‘stalking people around the internet’ which let’s be honest, is a fair statement. However, retargeting can be effective for your business — especially when paired with giveaways. Whether you decide to use Adroll, Facebook, or a comparable service, the setup is similar. You’ll add a retargeting pixel to the post that hosts your giveaway. You’ll create awesome ads with a great value proposition and show them to your entrants while they surf the web. Remind them of what they’re missing out on by not joining your brand. It’s all about the long game. Don’t let the valuable data and engagement you’re receiving from your giveaways go to waste. You’re in it to win it. What have you done to help increase engagement after running a giveaway? Share it with the community in the comments below.